STIHL powerful petrol brush cutters cut through thick and thin or where it’s not possible to use a lawn mower , for instance on verges, steep banks or around obstacles. With such a large range of petrol brush cutters, we have the perfect model for the task at hand, so whether you’re trimming lawn edges, or clearing scrub, look no further. All our brush cutters are fitted with efficient 2-MIX or 4-MIX engines to lower fuel consumption and significantly reduce exhaust emissions. 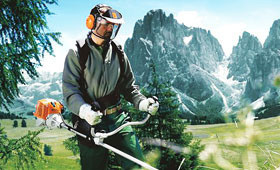 There are also a large range of accessories available for STIHL petrol brush cutters including various mowing heads, cutting blades, replacement mowing head line and harnesses.